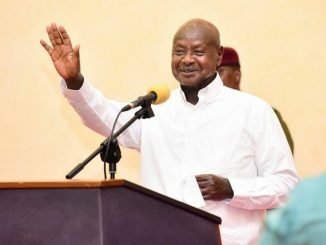 President Yoweri Museveni has ordered for thorough investigations into the cause of the Gaaga bus accident that claimed the lives of dozens of people in Kiryandongo district on Friday night. 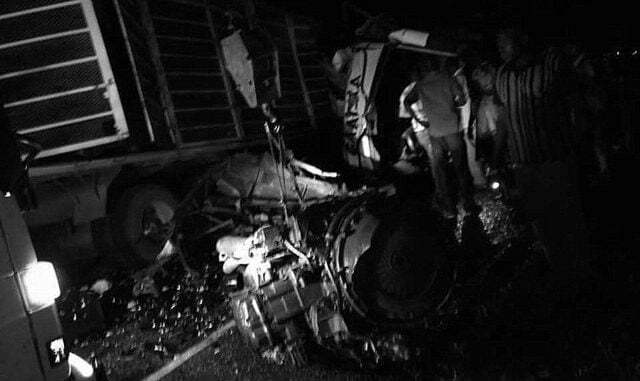 22 people were killed and 15 others injured when the Gaaga bus registration number UAK 562 L hit the rear of a tractor UAT 088 J / UAT 321 M before colliding with an oncoming truck registration number UAT 088 J / UAT 321 M.
The accident occurred in Nanda village, some 12 kilometers from Karuma Township in Nyamasha Parish in Mutunda Sub County in Kiryandongo district. Government has since declared three days of national mourning for deceased, which started on Sunday and will end on Tuesday. Government has also ordered Shillings 5 million for the compensation of each of the deceased and Shillings 3 million for each of the injured. On Sunday, the Lira Elder’s Fellowship held a requiem mass at Akiibua Stadium to mourn the lives of the deceased. 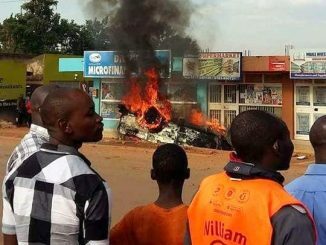 In a condolence message read on his behalf by the Lira Resident District Commissioner, Robert Abak, President Museveni revealed that preliminary police reports blame the accident on speeding and operating vehicles under dangerous mechanical condition. “While we await a detailed report from police, initial investigations point both to over speeding and using vehicles under dangerous Mechanical condition as the cause of the accident,” he said. Adding that, “The traffic police must step up vigilance on the road especially ensuring that vehicles that are not road worthy are not allowed on the road.” He expressed his condolences to the bereaved families and the injured. Speaking at the same requiem mass, Joy Atim Ongom, the Lira District Woman MP who represented the Lango Parliamentary Group, asked police not to compromise on traffic polices and laws. “How can the bus drive through Lira, Kamdini and Karuma up to Kiryandongo only in the night and make a return journey within a day?”Atim asked. Rev. Joseph Franzeli, the Bishop Lira Diocese urged different mourners to use the time to reflect on their commitment to the words of God. “Much as we are mourning, we must hold on to our faith and continue trusting in God,” he said. Rev. Dr. Alfred Olwa, the Bishop Lango Diocese quoted Psalms 26:1 during the requiem mass and urged Christians to trust in the Lord all time. “I want to thank the government of Uganda for trying to enforce the law, and declaring three days of national mourning. Our country is in trouble, we have road accidents every, we really need the Spirit of God to help us change our attitude and ways of living positively,” he said.